The beginning of a very, very good thing. The best condominium value in the Lower Mainland, The Grand offers you the opportunity to be a part of the charming, established community at Willow Creek. Located in Aldergrove, a city on the cusp of an incredible revitalization, you’ll find a place that values good neighbours, small businesses and fresh air. This is where fresh produce comes straight from the fertile fields just down the way and parks dot the landscape. The Grand is a way back to a simpler way of living. And that’s a very good thing! A modern home that’s away from it all, yet close to everything. The Grand is a boutique collection of only 47 condominium residences filled with charm and style. Large, open living spaces, ranging from 668 to 1,240 sq. ft. embrace the outdoors and combine the best of classic and contemporary design. 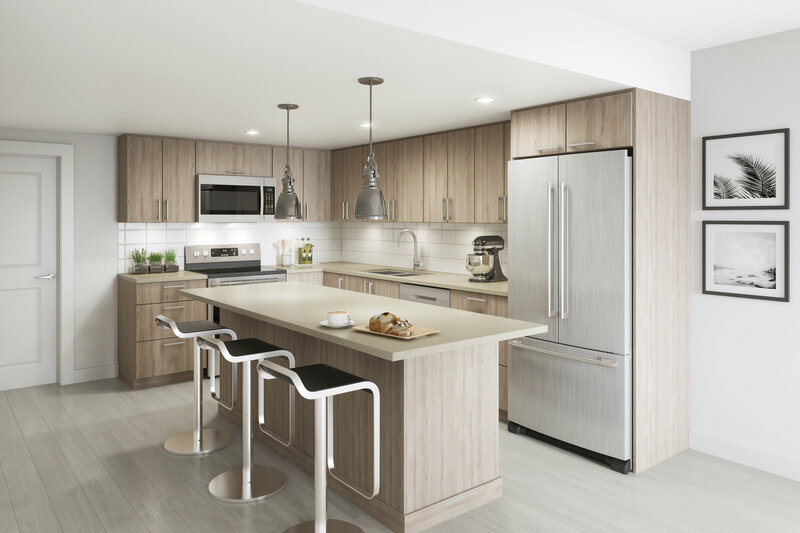 Some of the must-haves include the gourmet kitchen featuring rich wood cabinets, sleek stainless steel appliances and classic quartz counters. Stylish design and a great location are only part of the story. Look closely and you’ll also see quality construction, energy saving designs and the latest Rainscreen Technology. It’s all here for you at The Grand. A beautiful home for today, a great investment for tomorrow. It’s the perfect balance.